Most experienced walkers and hikers will understand the importance of careful and suitable sock selection before they begin their chosen activity but for new people to the hobby it is possible that not a lot of thought has gone into this issue.It is important that we pay attention to our footcare and try to protect them from damage and prevent any complaints arising. If in appropriate socks or footwear is selected the results can be sore feet and ankles, blisters and chafing of the skin. This can not only cause discomfort but also puts thee affected area at risk of infection.When such issues arise it can cause the person to prematurely end the activity which can cause a lot of disappointment especially if the walk or hike is being done for charitable purposes. 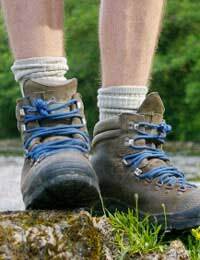 Walking socks are traditionally thicker than normal socks because of the nature of the activity and the design of special walking and hiking boots. The boots are designed to give full support to both the foot and ankle and must be sturdy enough to allow the hiker to cover rough terrain as this is common when participating in a proper hike.The socks should protect the foot and prevent any rubbing caused by the walking boot. It is important that the boot is large enough to accommodate the walking socks. When purchasing a new pair of hiking or walking boots they should ideally be tried on when the appropriate sock is worn in order to assess whether the boot fits adequately. If you are anticipating a short walk that does not involve difficult or challenging terrain then it may be fine to wear a simple trainer that is comfortable and gives some degree of support. In this instance trainer socks and liners may be worn as long as the back of the heel is protected against chafing.If however, you are expecting a long walk covering several miles it is advised than the footwear chosen fits the purpose. In this instance a running sock or liner will not provide enough protection and may lead to blisters developing. Some people may find that they will till encounter some problems even when wearing the most appropriate sock for the purpose. Sometimes it may help to turn the sock inside out in order to keep any internal seams away from the skin which will help to stop friction from the seam line becoming a problem.It may also help to ensure the feet are clean with nails kept short and even as long nails may cause discomfort after walking for some time.The use of a soothing foot cream or gel can help keep the skin soft and devices designed for the removal of hard skin can contribute to lessening painful symptoms.Following the walk, the feet should be bathed to remove the build-up of bacteria on the skin and patted dry to help prevent fungal infections. A cooling foot gel can help relieve the discomfort of tired and aching feet and the socks should be washed after use and the boots or shoes allowed to air to help prevent bacterial build-up. Footcare is a very important aspect of both personal hygiene and preventing problems occurring. Appropriate footwear selection including the socks or liners used should be a high priority and given consideration to.